In legend and lore, a mermaid's song was irresistible to sailors. In modern times, mermaids capture our fancy with snazzy hairdos and colroful patterns. 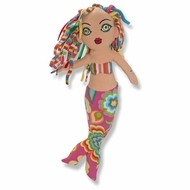 Meri Mermaid, with her flowery hot-pink tail, striped bikini top and wild, wavy hair, always makes a fashion splash. Like all Melissa and Doug Beeposh plush toys, she's crafted of top-quality fabrics and fill in a vibrant mix of colors and is wonderfully huggable, tip to tail.